Westminster hosts some of the world’s biggest events, from huge street carnivals to sporting events and concerts in London’s many parks. No area in the UK sees as many large events as Westminster does. As such our experience in dealing with events in unrivalled. These substantial events can produce tonnes of waste, all of which has to be managed throughout the event and quickly cleaned up afterwards. 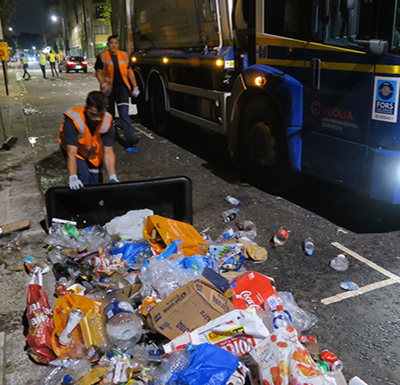 The waste created can come in all types and sizes, and that makes Westminster City Council Commercial Waste Services the perfect partner for large events as we can deal with every waste type on behalf of event organisers. We are proud that we are able to overcome the challenges that arise from such a diverse and populous city, offering waste management services which few others can match. Throughout any event, we also recognise that the health and safety of all attendees is paramount. Waste is a matter of high importance when talking about health & safety as it has the ability to quickly disrupt events through security or safety issues. By using Commercial Waste Services as your partner for event waste management you will know that no rubbish ends up in landfill or other undesirable places. You will also minimise unnecessary vehicle movements, vehicle emissions and congestion using our locally based vehicles and staff. The events you might organise will come in all shapes and sizes, but no matter how big or small your event is, we can provide an event management service to support it. Services including equipment hire, on-site staffing, management of all known waste and recycling streams, street sweeping and washing, deep cleaning and general clean up services can all be arranged through our experienced managers. Our understanding of such events means that whatever your own event’s requirements, we are able to assist and advise you. We don’t settle for providing after event cleaning services. We also offer additional services that can make managing the waste at your event less stressful. Unlike some other waste collectors, we offer a full service to our clients. Before your event goes ahead, we can provide a complete site assessment. This gives you and us a better idea of how and where your waste is going to be produced, stored, collected and taken off-site. Talk to one of our event waste experts to organise a site assessment. There are a number of waste-related risks to take into account throughout events, no matter the size. Our experts can help you avoid these to ensure your event flows as it should. Talk to one of our event waste experts about how you can minimise risks. We offer bin rentals of all kinds, allowing you to separate your waste streams. Our bins come in a range of sizes, so no matter what size your event is, we have a bin for you. See our full range of bins. 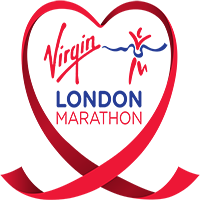 We can give you the advice and support you to need to help your event stay within the law. 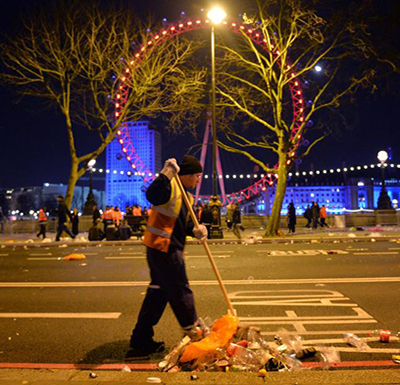 There are strict laws on event waste management in Westminster, and it’s crucial that you have a waste operator that meets these requirements. As we mention further down the page, ‘zero waste’ is the term for sending no waste to landfill sites. At Westminster City Council Commercial Waste Services, this is already happening. Instead of sending waste to landfill, we use the general waste we collect to generate electricity, used in London homes and businesses. 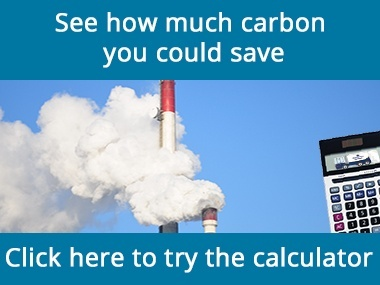 Our carbon calculator can you show exactly how much carbon your event will be producing. You can compare our services to other waste operators, and see what impact adding additional recycling facilities has on your CO2 output. See how much carbon you could be saving with our event waste services. Talk to our event waste management experts, they have decades of experience in helping Westminster based events achieve an environmentally friendly waste management service. Our experts can provide you with valuable insights into how you can improve your waste management operations, or offer you advice on services that may improve your waste management. Get in touch today to see how we can help your event. Events will inevitably produce some general waste. However, none of the waste that we collect is sent to landfill. So even if your event creates a significant amount of general waste, we can take that to our Energy Recovery Facility where it is turned into power for London homes and businesses. Recycling is crucial to making your event as environmentally friendly as possible. We offer a range of high-quality recycling services that you can use at your event. Not only will they help to reduce the burden on the environment but they're cost effective too. There is often a significant amount of food waste produced at events. All of the separated food waste we collect is sent for composting in an anaerobic digestion facility. This is the most environmentally friendly method of treatment for food waste available in the UK. Events in Westminster can often leave pathways, pavements and roads incredibly dirty. It is your duty as organiser to ensure that the streets of Westminster look the same before and after your event. So if you require a full post-event cleaning service, including deep cleaning, we can help. We have extensive experience in cleaning up after events of all sizes in parks across Westminster. Below are the four most popular areas that we provide our event waste management services in. If you are organising an event at one of these locations, or another park in Westminster, please talk to our event waste experts to see how we can help you. 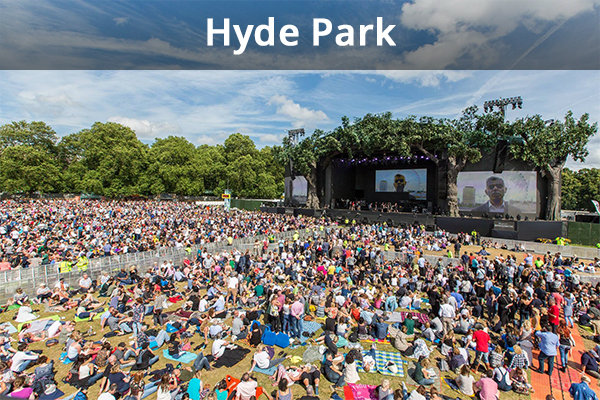 If you’re organising one of the many events in Hyde Park, whether it is as large as British Summer Time or a smaller sized event, talk to our event waste experts to see how we can help. 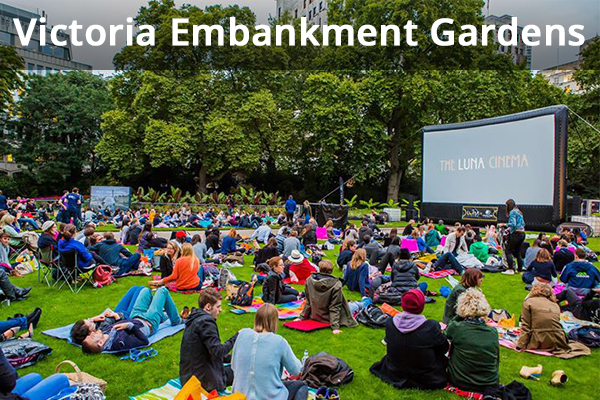 Victoria Embankment Gardens is famous for hosting food festivals and other outdoor experiences. If you are organising an event, please talk to our event waste experts to see how we can help you. 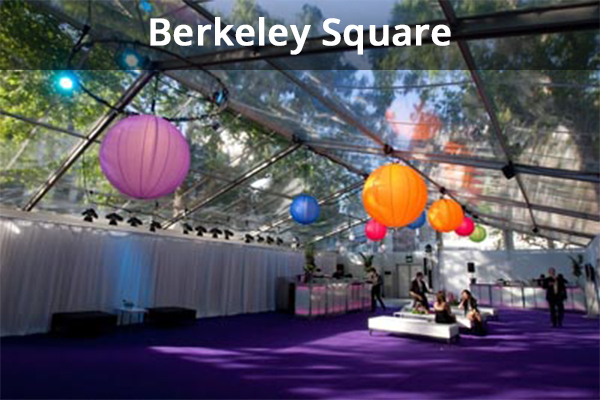 Berkeley Square is one of the smaller parks in Westminster, it is the perfect location for smaller scale events. Please contact us to see how we can help you manage event waste. 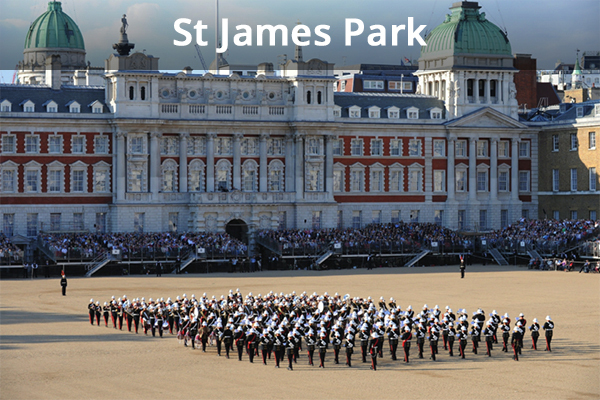 St James Park is the home of prestigous events such as Trooping The Colour. If you organise events in St James Park, talk to our event waste experts to see how we can help you. 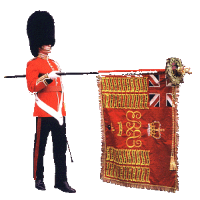 Are you planning an event in Westminster? If you’re looking to host an event in Westminster then it’s important that you contact the right people to get permission first. Applying to film or hold an event. Latest event and filming information. The term ‘zero waste’ is not about producing no waste at all – this would be impossible. What this actually refers to is not sending any waste to landfill sites. This target is entirely possible. It is inevitable that a large proportion of general waste will be created, no matter how hard you try to make people recycle. It is your responsibility to ensure that none of this waste is going to landfill. Here at Westminster City Council Commercial Waste Services, we ensure that none of our waste including that collected from events gets sent to landfill. Instead, we use the general waste we collect to generate electricity and district heating which is used in London homes and businesses. By using our services, you will always be achieving ‘zero waste’ and reduce your carbon footprint immediately. 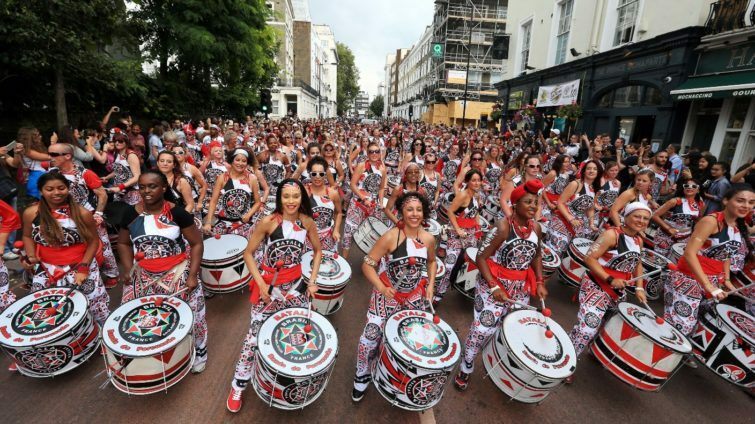 Europe’s biggest street carnival, Notting Hill, is an event that results in hoards of waste left behind the nearly 6km route. Each year sees around 200 tonnes of waste that has to be cleared in just a couple of hours. To do this we have a team of roughly 170 operatives and 60 vehicles (including refuse collection trucks, mechanical sweepers and water flushers) that work through the night. All general waste collected was turned into electricity and enough energy to power 60,000 hot showers. All of the electricity and heat produced could have saved up to 54 tonnes of CO2 emissions! 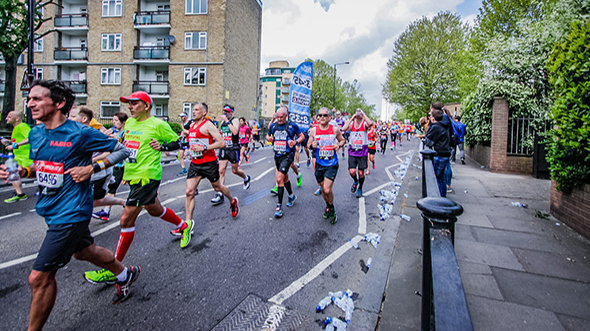 The London Marathon is one of the worlds most anticipated running events. Nearly 40,000 people take part in the race each year, accompanied by thousands of more spectators. The grand event generates approximately 11 tonnes of rubbish, made up of 10,000’s of empty water bottles that are recycled into new items. 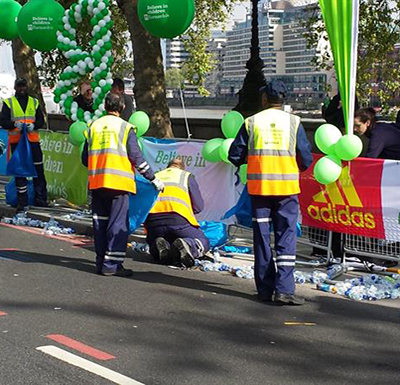 Once the Marathon has finished, the 60 member post event cleaning team start their marathon of collecting all of the litter and aim to cover the entire event area in under 2 hours. 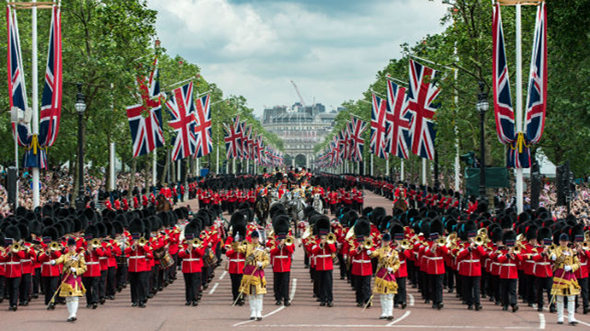 Trooping the Colour is a ceremony where thousands of people gather to celebrate the Queens birthday. The event is held over a series of days, each of which ends a large clean-up process. The clean up requires a range of different services due to the different kinds of waste that are generated at the event. Our extensive and flexible resources ensure we have the capacity to deal with all kinds of rubbish. 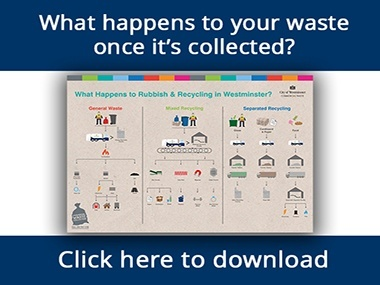 Do you want to learn more about event waste management in Westminster? What happens after your event rubbish removal? We have produced an infographic that illustrates exactly where our waste goes after it is collected. So you can see that your waste is being disposed of in an environmentally friendly way, no matter what waste type is. How much carbon is your waste producing? We have built a carbon calculator that shows how much carbon your waste produces, compared to how much it would produce with our services. See how much carbon you could be saving by using different recycling techniques. 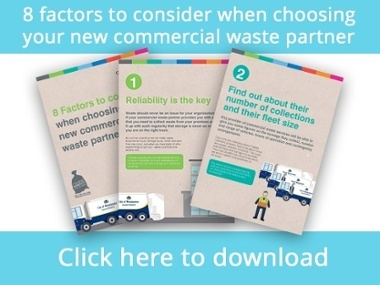 This guide includes useful questions for you to ask potential waste collection partners. How you go about assessing different costs and making sure you know where their waste goes. Make sure to ask these questions to your new partner. This guide and best practices for event waste management is designed to help your event along the journey to achieve zero waste to landfill by 2020, no matter size, type or location. See how you can achieve zero waste at your next event. This video from Vegware (a recyclable packaging manufacturer) is an excellent example of festival waste management. It shows how the 2014 Glasgow festival and Commonwealth Games achieved zero waste with the help of their packaging. See how they achieved zero waste events. The London 2012 Zero-Waste Events Protocol was designed to support and encourage best practice for managing waste at events associated with the London 2012 Games. It’s a perfect example of how large-scale events can now generate ‘zero waste’. The European golf tours flagship event attracts 90,000 people to watch the worlds elite golfers over five days. The European Pathway to Zero Waste has worked to ensure the PGA tour achieves ‘zero waste’ and meets sustainability requirements. We provide event clean up services everywhere in the City of Westminster, see if your event falls within our radius below.